very interesting or colorful, especially when slightly scandalous or improper: a juicy bit of gossip. Synonyms 3. racy, risqué, titillating, sensational, lurid. I love in yoga when the instructors say make it a ‘nice juicy rinse’ when you’re twisting into a pose. So when you’re really cranked and really sweating it out… squeezing all the toxins out like you’d squeeze an orange. It’s a great feeling, and always a funny word. I’ve been wanting to do this for a while but haven’t had quite the will power. But during my teacher training since I’m ‘cleansing’ (I’ll go into more of this later). I decided to try Juicing on Monday’s. Yesterday I hit up Whole Foods – and only spent $150 ! Why is that place so freaking expensive? Anyway, tons of fresh fruit and veggies later I made 4 juices for the day and that’s all I’ll have, besides herbal tea and tons of water. Carrot/Grapefruit , Celery/Apple, Tomato/Cucumber, and Celery/Pear were the general combos. 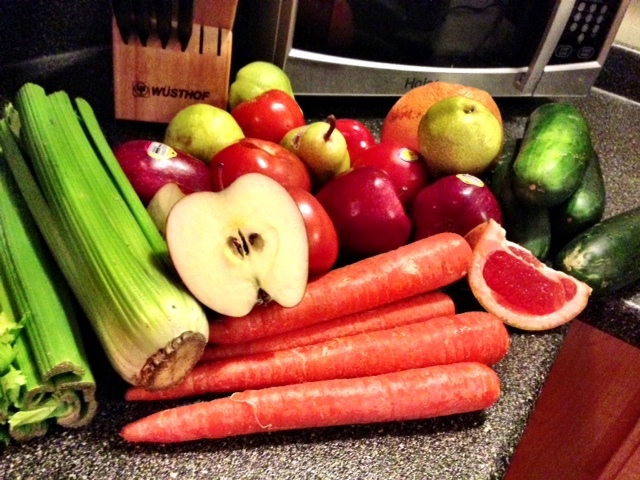 Tags: eatclean, healthy living blog, how to juice cleanse, juicing, yoga. Bookmark the permalink. Are you doing a juice fast for a few days or just adding juice in? hi! i just did a one day juice fast. 4 – 16oz juices and herbal tea all day that’s it. it was good, i actually wasn’t hungry. i’ve done three day ones before but those i usually buy. hope that helps! thanks for your comment.